Reliable, trusted and modern. 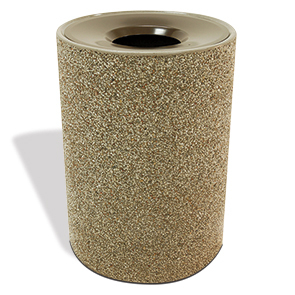 Maintain facility cleanliness with a lasting, low maintenance 41 gallon round concrete trash receptacle. The natural strength and durability of concrete is reinforced with steel rebar to ensure exceptional long term of service even in the most demanding of climate conditions. The precision crafted aluminum funnel lid provides 360 of hands-free access to responsibly dispose of litter. Comes standard with polyethylene liner and security cable. This large 41 gallon round concrete receptacle meets ASTM requirements and is available in many standard and premium colors and finishes.